Contrary to those who want to put their head in the sand and deny the severity of our traffic problem, this survey clearly shows that an overwhelming majority does think traffic is a serious problem. It’s unfortunate that the poll does not explain the full benefits of the Mayor’s proposal, including improved mass transit options for New Yorkers who currently lack good bus, subway, train or ferry service- which a congestion charge would pay for. Asking people if they want to pay more to drive without explaining what they are paying for doesn’t tell us anything we didn’t already know. When New Yorkers learn of the many benefits that come from congestion pricing, they become supporters. That has been the case in London and Stockholm, where initial concerns became widespread support when the benefits kicked in. fight the menace of global warming with a 30% reduction in carbon emissions. 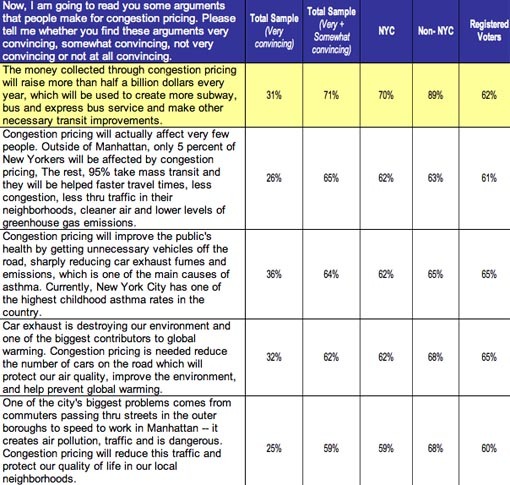 The Campaign cited its own recent poll showing that New Yorkers respond positively to the congestion pricing plan when informed of its benefits. The poll was conducted by the firm of Penn, Schoen & Berland Associates between April 24 and April 30, 2007. Noting one example, the Campaign said that more than 70% of New Yorkers polled found it strongly or somewhat convincing when told: "The money collected through congestion pricing will raise more than half a billion dollars every year, which will be used to create more subway, bus and express bus service and make other necessary transit improvements." Similar findings were recorded when those polled where told about public health and environmental benefits. the poll failed to tell those polled that bridge and tunnel tolls would be credited against the $8 charge, which would be the total overall charge daily. 90% of those polled by Quinnipiac did agree that New York City traffic is a "serious" problem; 59 percent of city voters said the problem was "very serious," while 31 percent said traffic is "somewhat serious"
Um…exactly. You can’t just talk about a positive benefit or a negative consequence without understanding the trade-offs. Pollsters who ask about policies in a vaccuum get very predictable results. Polls that recognize the complexity of the real world are not only more accurate a reflection of public opinion, but provide a better guide to policy alternatives. The Quinnipiac University Poll is directed by Douglas Schwartz, Ph.D. and he can be reached at doug.schwartz@quinnipiac.edu or 203-582-5201. Give him some feedback on what you think of his poll. Am I reading this right? In every category in the Penn/Schoen poll, non-NYC residents are more supportive of pro-pricing statements than NYC residents? For instance, question one: 70% NYC residents, 89% non-residents agree. This seems counter intuitive since non residents would benefit from transit improvements and traffic reductions much less. They also have much higher car ownership. According to the 2000 census, 56% of NYC households do not have a car. So why would 68% of non-residents think through traffic heading to CBD is a problem that would be reduced by pricing and only 59% of city residents? The city residents are the ones suffering from the traffic. Am I reading this wrong? Quinnipiac Poll has been around for a long time and apparently has much credibility being it is so widely quoted. PNYC on the other hand hired a consultant called “GloBal Impact” to do its recent poll. It seems to me that their approach just skews the results to meet the agenda of the people paying them. What a surprise! How bout: Would you ever consider eating dog meat? If you knew that dog meat was considered a delicacy in some parts of the world and was a better sourse of protein than other animal products, would you eat it then? You ask why New York residents who don’t own cars (or who drive them infrequently), would be opposed to congestion pricing. After talking to some of these people about the issue, I can only conclude that a substantial portion of New York would like to drive around by private car, but cannot because it is already so expensive, especially the cost of parking. But these people have the ambition, so to them congestion pricing feels like yet another barrier in “stepping up” to car ownership. They may not own cars now, but they support car owners because they hope someday to join their ranks. It is understandable why non-NYC residents would be more receptive to congestion pricing than city residents. Schaller’s data already tells us that the bulk of commuters to Manhattan live in the outer boroughs. Non-city-residents are more likely to be occasional drivers who have relatively good transit options, but make a decision to drive because it’s cheaper. And it often only takes two people to make it cheaper. Because of the bridge and tunnel rebates, congestion pricing will add only $2 to the cost of driving in from NJ, Westchester and Connecticut, and promise less congestion upon arrival. So they would be irrational to oppose it. BTW, I am surprised that there has been no discussion about the free pass being given to the circumferential roads along the rivers. In addition to HK’s comments, I think the much greater availability of Park & Rides outside the city increases the likelihood that automobile owners can still drive from their homes to transit and then take MetroNorth or LIRR or NJ Transit. Speaking of NJ: It seems they already face a congestion charge which will be completely deductible? I’m not sure of that. And for the occasional driver into the City, they might realize they will get faster access to their destination. There are ways to induce out of city occasional drivers to switch to transit. One is by offering small group rates for tickets (and advertising them). That way it will still make (economic) sense for a family to come by train instead of car. The other, of course, is to run those trains more frequently.